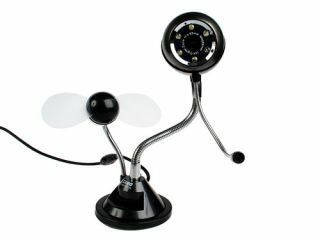 Brando's new four-in-one webcam/microphone/light/fan is the perfect bit of desktop kit for those hot and sweaty summer days in the office. "This USB 4-in-1 Web Cam can be attached to any neat surface - table, glass with a flexible sucker," Brando informs us. It's also useful if you need to dry your hair at your desk or if you are working into the wee small hours of the morning, when you can use the LED to shed some light on proceedings. Plus, if you don't have a built in mic on your work machine, it's just the ticket for using IM and videochat features on ICQ, MSN or Skype.